Wife of Rivers State Governor, Justice Suzzette Nyesom-Wike has commended medical professionals for always sacrificing their time and lives to serve the people. Speaking at the University of Port Harcourt Teaching Hospital on New Year Day when she visited the New Year baby, Justice Suzzette Nyesom-Wike said that the medical professionals deserve support from members of the public, rather than being objects of attack by criminals. She thanked God for the successful delivery of the New Year babies in the hospital. 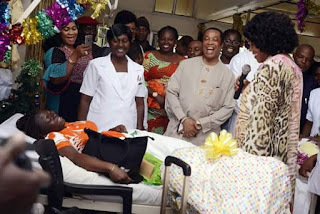 She said: “My first day of this year started with a visit to the University of Port Harcourt Teaching Hospital (UPTH) where I met with the parents of the first child born in that hospital this year. They are Mr. Achus and Mrs. Boma Harrison and their baby girl, (also their first child) was born at 1.50am and weighed 3kgs. They are Rivers State indigenes from Abonnema in Akukutoru Local Government Area. She commended the medical team of the UPTH for their professionalism, praying that God will strengthen them in 2016 to serve the people diligently. “I highly commend the medical team at the UPTH for their dedication to duty and team spirit. I wish them all a happy and successful 2016”, Justice Suzzette Nyesom-Wike said . The governor’s wife added that the welfare of children will continue to receive priority attention by the administration of Governor Wike. Justice Suzzette Nyesom-Wike was accompanied to the University of Port Harcourt Teaching Hospital by the Commissioners of Women Affairs (Mrs. Ukel Oyaghiri), Agricultre (Mrs. Onimim Jacks), wife of the Head of Service (Mrs. Matilda Godwyns), wife of the Chief of Staff (Mrs. Grace Woke) and other wives of top Goverment functionariries and we were received by the Chief Medical Director (CMD) Prof. Aaron Ojule, the Chief Matron and other nurses.